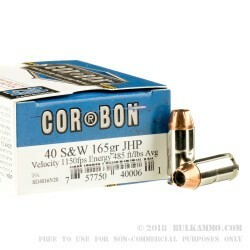 This 40 S&W cartridge by Corbon features a 165 grain jacketed hollow point projectile, ideal for self-defense. 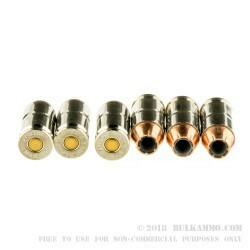 This cartridge offers a substantially higher muzzle velocity than comparable rounds at 1,150 fps, which gives its projectile the power it needs to penetrate clothing without letting the fabric impede its expansion. This round’s bullet has a gilding metal jacket which is specially scored inside and out to ensure uniform and rapid expansion. As the result the jacket and its lead core will peel all the way back to their base during expansion, providing tremendous stopping power. This round’s bullet’s rapid expansion also helps to prevent overpenetration, a welcome feature in scenarios where bystander safety is key. 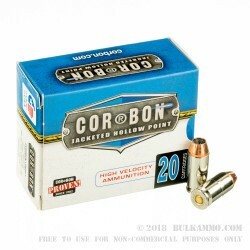 Corbon takes their time making their ammunition according to their tried and true methods. As the result they are not a high-output manufacturer, but the the ammunition that they do meticulously produce lets them back it with a 100 percent satisfaction guarantee. 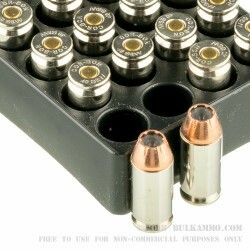 The only ammunition I trust to defend my family's life with. Goes bang every time.